Please read this story about a mixed team of experts from disciplines including biology, chemistry, physics, engineering and materials science that found a fertile intersection between nature and advanced industrial processes. 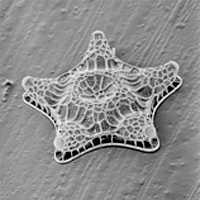 Short description: Knowledge of a micro-organism, the single-celled diatom, may make the manufacture of products like cosmetics, paints, fabrics, credit card holograms, cheaper and greener. The hard shell of the organism is iridescent; it displays vivid colours that change depending on the angle at which it is observed. Manufacturing material with these properties is complicated, expensive and energy consuming, but scientists now believe that diatom shells can be farmed on industrial scale. It seems that shell structures in nature have a lot to offer. Compare this case with Dan Edelsteins's solution for the manufacturing of the next generation of microchips. It is also high-noon time for me to announce what promises to be an amazing event! The Medici Summit on March 3rd and 4th next year will be unusual in its structure, exciting, inspiring and just plain fun. It is now open for registration and I am really very excited about this. It has long been a desire of mine to put together a conference that mimics the Medici Effect where people can come in with their own ideas and leave with those ideas recombined with someone else’s. There will be awesome speakers and plenty of opportunity to connect with others (some of them will be surprises and are not outlined exactly in the schedule). Very, very excited about this one! It is open for registration right now so head over there and register! OK – I am on my way back from an event at Novartis in Basel and am finally taking some time to update you on some of the amazing things that have happened during the fall and will happen in the spring. Earlier, in November, Florence had a Medici Effect Day and I gave a talk at Galleria dell"Accademia and I just had to tell you quickly about it because both my wife and I were humbled and amazed. had organized to bring me over to introduce the week of Humanistic Capitalism in Florence with The Medici Effect Day to some 120 of Florence’s top business, political, artistic and scientific crowd. My job was to introduce the Medici Effect and inspire a renewed innovation and entrepreneurship effort in Florence (with the help of a translator as virtually no one spoke English). 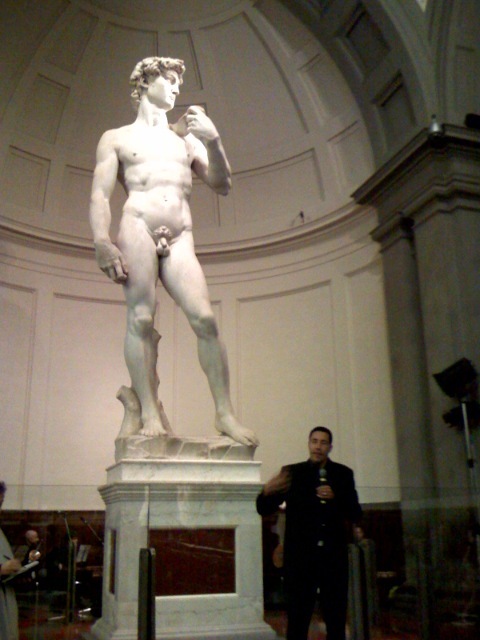 They had me speak right underneath the original David statue, one of Michelangelo’s master pieces and defining of the Medici’s power during the Renaissance. It was a mind-blowing experience. Particularly as I later learned that such a public event had only happened in front of the David statue once before. The rest of the trip continued to be amazing. Secret corridors in the Uffizi, hidden chambers in Palazzo Vecchio and, of course, amazing food. Volvo’s Your Concept Car that was developed a couple of years ago by a women only team is old news. But the idea has spread. Bettan is the name of a network of women within the concrete construction industry that has been inspired by the Volvo project. They are now presenting the concept house Konkret Vision – a flexible home that is based on female experience and adaptable to the needs of a modern household. An additional goal is to attract more women to the building industry which is strongly dominated by men. The posts I have written about the increasing role of women in Swedish business and economy have been quite general and based on statistics. Therefore I will keep my eyes open for specific cases where female experience and input have had innovative impact. Maybe we will see more design teams consisting of women in traditionally male fields. Many reflections on creativity and innovation can be made regarding the Nobel Prize. Each award represents groundbreaking achievements of the highest order and so far more than 700 men and women have become Nobel Prize laureates. Today, December 10, that list will be a couple of names longer. In order to connect this to innovation through intersections of fields and cultures I will relate some research by Professor Gunnar Törnqvist. He specializes in Economic Geography and is a member of the Royal Swedish Academy of Sciences. He has devoted a lot of work to studying the creative processes behind the science prizes. Based on a vast material of statistics, biographies and other sources he has looked at factors like family background, education, career choices, collaborations, movement between countries etc. Some findings are expected and others are more remarkable. For instance, it is estimated that 20 percent of all science laureates grew up in Jewish homes in Europe. Törnqvist discusses different explanations for this overrepresentation. One is that being part of a minority makes an individual familiar with different cultures – the one at home and the one of the surrounding society. Such natural switch between perspectives cultivates an open mindedness that is an advantage for any scientist in search of new answers. Another factor is that most of these scientists had to leave Europe and therefore continued their careers at the top universities in America instead. If you look at the lives of innovative researchers (like the Nobel Laureates) it seems that it is an enormous advantage to have moved between countries and universities; it results in a mix of perspectives and many meetings. Many of these men (yes, they are all men) are originally from Hungary and therefore they also belong to another group that is astonishingly overrepresented among Nobel Prize laureates: Scientists who, as young boys, were educated at the finest high schools in Budapest in the beginning of the twentieth century. According to Törnqvist 20 of the top scientists of the last century grew up in Hungary. He argues that there is more creativity in times of turbulence and Budapest really was diverse and politically instable in those days. Almost all of these Hungarian laureates-to-be migrated to America and Törnqvist stresses the importance of this move from one academic context to another. He convincingly shows that there is a pattern; that there are circumstances that inspire and catalyze innovation and that exposure to different perspectives and cultures has a significant impact on the creative performance of individuals. Read this article by Ross Tieman in Financial Times. It is about intersections in different ways - the convergence of fields and unexpected partner combinations. He describes the massively lucrative field that emerges in the ongoing large scale fusion of telecom and software industry. He also exemplifies how the most unlikely business partners – where competence overlap is small and friction initially is a problem – may provide the best revenue opportunities. Twelve years ago Swedish born Kristina Karlsson came to Melbourne with nothing but two empty hands and she had no business experience. In 2001 she started the stationery label kikki.K that today has 300 employees and a turnover of roughly 40 million USD. Hard work is certainly an important factor behind the success, but, interestingly, the fact that she is a foreigner was a crucial asset. When she identified a gap in the home office market she filled it with a label that sells simple, timeless and stylish stationery products in a typically Swedish design. They would hardly be regarded as original in Scandinavia but on the Australian market they represented something new and were welcomed by enthusiastic buyers. kikki.K is now established in many cities in Australia and New Zeeland and Karlsson has received business awards as well as media attention. The rapid growth of the young company is impressive and it is a great example of business innovation driven by the movement of people. When you act in a context that is different from the one where you grew up there is a much greater chance that your thoughts and ideas will be divergent from the ones around you. In other words rather obvious ideas may be innovative if you exploit them on a new location or in a foreign culture. It would probably be hard to launch kikki.K successfully in Sweden in 2001. But in Melbourne - practically as far away from Sweden as you can come – Kristina Karlsson placed herself in the intersection of Swedish design aesthetics and the Australian market and it worked more than well.